RYT300/QCI level 2 comprises of practices from traditional yoga styles like Satyananda yoga (Bihar school), Ashtanga Vinyasa and other modern approaches like Iyengar Yoga. Structured around the needs of a serious yoga teacher, the program is developed to enhance steady growth and development beyond the foundational levels of RYT200. Built around Abhyasa (practice), Adhyayana (research) and Sadhana (mastery), the RYT 300 program is a unique curriculum structured for the advanced yogi. The 300 hours program delves deeper into topics covered during 200 hour and more. The course is based on traditional format of yoga education as practiced in India. It prepares you to take your practice and teaching to the next level. This module is designed for the needs of the advanced teacher who is keen to deepen personal yoga practice and teaching. It comprises of advanced Hatha yoga sadhana and covers practices from traditional yoga styles like Satyananda Yoga (Bihar school), Ashtanga Vinyasa and other modern approaches like Iyengar Yoga. This module provides students opportunity to study, discuss and debate various yoga philosophies (Sankhya, Yoga Sutra and Tantra) and understand both eastern and western approaches to body, mind and beyond. 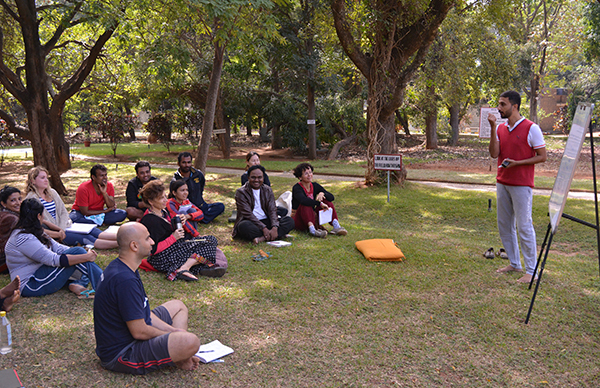 The practical aspects of food, lifestyle and detox extracted from the ancient wisdom of Sushruta and Charaka are also shared with the students. This module is designed to equip the student with both modern and traditional teaching methodologies. It helps in building confidence of students as a teacher and equip them with tools to design, sequence and execute tailor made yoga programs/sessions. Non-contact hours includes personal sadhana, seva and teaching hours. The non contact hours may be completed through a more flexible approach keeping in mind the existing scheduling constraints of an active teacher and satisfy the core requirement at their convenience and flexibility. The course is divided up into two modules.The first module focuses on building further on the strong fundamentals of RYT200. Practice and master Advanced hata yoga techniques mentioned in traditional yogic texts. Understand eastern and western approaches to body, mind and beyond. The second module is about effectively communicating one’s experience and knowledge of the practices with aspiring students. This module blends modern and traditional teaching methodologies. Yoga has been evolving, so are the teaching methodologies; discover what it takes to be an inspiring yoga teacher, a life coach. Learn to teach beginner, intermediate and advanced hata yoga sessions. 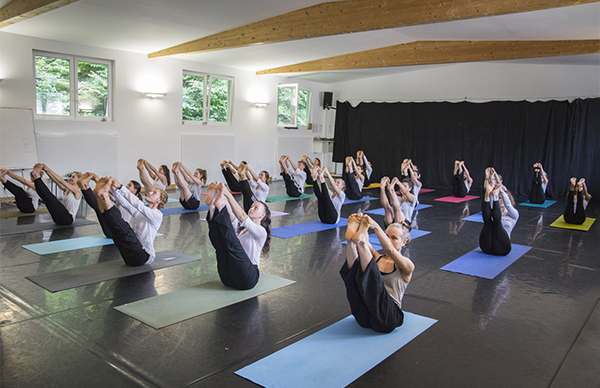 Design, sequence and execute tailor made yoga sessions for special needs. Build confidence to handle group and personal yoga sessions. Indira’s earliest ‘fitness-related’ childhood memories are of her father – shaking her and her brothers’ awake everyday at the crack of dawn for a jog/swim/rowing/tennis. “Even the hapless family dog was not spared!” she says. As kids, she and her brothers despised their dad’s strict nature, but today she is deeply grateful to him for instilling a lifelong commitment to physical fitness. Her dad is her first guru – his photograph occupies a pride of place in her Yoga room. Her first encounter with Yoga was a complimentary class held in her college in Chennai. She enjoyed it thoroughly but did not pursue it – finding Jane Fonda and step aerobics so much more ‘glamorous’ and exciting. 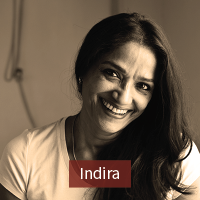 At that time, she says, ‘I had zero knowledge of just how incredible an art and science Yoga is.’ Following a Masters in Communication, Indira began a 25 year long career in Advertising. The stress – and eventually – the meaninglessness of her work led her to dive deeper into the practice of Yoga. Initially, it was about mastering the Asanas, but a couple of years later, her Ashtanga Yoga teacher introduced her to the philosophy behind the practice, and there was no looking back. With her guru’s blessings, the next several years were an ‘insane’ mix of Advertising, intense personal sadhana, and study of Yoga philosophy. Quitting advertising was, she says – inevitable. She completed her RYT 200 and 300 and has, since then, been teaching full-time at a1000yoga. In the last three years she has been on the faculty of a1000yoga’s Teacher Training Certification Courses as well. He has been teaching yoga in Mysore, Bangalore, Bangkok, Kuala Lumpur, Colombo, and Hyderabad and is adept at Bihar, Iyengar and Ashtanga schools of yoga. 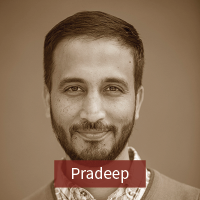 Pradeep currently heads a1000yoga and facilitates teacher training courses at the 200 hour, 500 hour levels and specialization yoga courses for Prenatal, Sports and Children. He has been training and mentoring over 1000 budding yoga teachers since 2006. Pradeep believes and practices “Yoga for Yoga” . © 2019 a1000yoga. All rights reserved.